Glamorgan bowler Ruaidhri Smith says his return to international cricket with Scotland is a "great opportunity" to develop his professional career. His call-up for the tour of Oman was the first time he had represented Scotland since 2016. Seamer Smith, 24, played two T20 internationals against Ireland and Netherlands, and two one-day internationals against Oman. He took four wickets for seven runs in the first 50-overs win against Oman. However, a pectoral strain in the second match, which Scotland lost, saw him restricted to bowling just three overs. 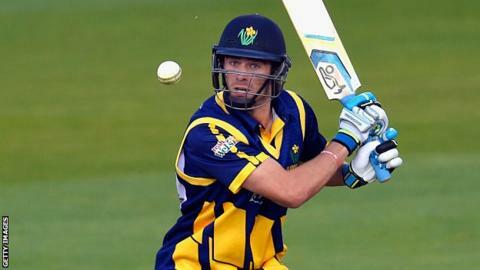 That injury is also set to keep him out of the decider, though he hopes it will not affect the start of his season with Glamorgan. Glasgow-born Smith represents the country of his birth, though he has English and Irish family heritage and grew up mostly in Wales. "There was a possibility of playing for Ireland, but I joined up with Scotland as my first choice and they've stuck with me," explained Smith. "I've enjoyed every match I've played from the under-19 team right through to the national team. "(My background) comes in handy when Six Nations rugby comes around, as long as a home nation wins, then I'm winning!" Scotland's fixture against Netherlands saw him pitted against county colleague Timm van der Gugten, with the Australian-born Dutchman coming out on the winning side. But Smith hopes that playing for Scotland will help to improve his performances with Glamorgan. "Getting the experience of playing against good sides like Ireland and Netherlands in different conditions is going to be beneficial to me, and getting cricket in the off-season is always good," added Smith. "It's something that I see as a great opportunity for me to develop and play against full member nations." His spell of four wickets for seven in the first one-day international against Oman, who were skittled for just 24, brought memories of a similar spell of four for six, for Glamorgan in a T20 match in Richmond in 2018. "It was fantastic, following on from the Middlesex T20 game, it was another one of those bizarre days where everything went our way. It was a bit surreal because there's normally a partnership somewhere along the line. "Oman is very similar to Dubai with pretty good facilities, almost purpose-built for the national team though weirdly the pitches have had a bit of life which you wouldn't expect in the Middle East. "Not so much in the way of crowds, I'm not sure how popular cricket is but it hasn't helped that a lot of the games have been in the day and in mid-week. But it's been interesting." Smith will now return to Glamorgan training in March ahead of the Championship season starting on 11 April, while Scotland host World Cup sides Afghanistan and Sri Lanka in May.